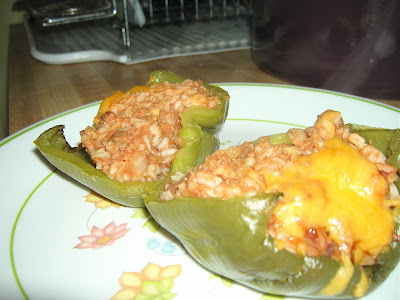 Stuffed peppers was one of my faves growing up, especially once I learned to appreciate the pepper as part of the meal, not just a container and when I learned to practice some restraint with the ketchup. In honor of this old-school comfort food, I even served it on “retro” plates (I’ve dined on the plates for about 20 years). Now this was arguably a whole lot of effort for lunch (about 90 minutes all told), but the dish turned out great and I certainly have no aversion to leftovers. Speaking of leftovers, I have rekindled love affairs with a couple of old flames — Goodwill and the Salvation Army. I have spent about half of my weekend hitting up all the locations in town (just gobs of free time when I can’t cycle). I scored some nice utensils and mixing gear and managed to talk myself out of a waffle iron — three times (either too small or not Belgian). Yes, I was that picky when it came to $4. I did find a great alternative purchase — some moccasin slippers for $6 ($24 discount on old stock @ Belks — a strange breed of Kohl’s/Mervyn’s that I just stumbled upon today). Good day, good weekend and “gooder” wrist. Oh my God! I never thought I'd see that combination again. You liked them???? The Salvation Army in Waco is one of the best thrift stores I have EVER encountered. You are one lucky mutha. You think? I guess it depends on what you're looking for. The Salvation Army is really close, so I drop off stuff there. I am very impressed with the Goodwill shops, especially the Valley Mills and La Salle locations. Of course, every time, every shop is different. That's what makes thrifting so cool. you blog about food a lot. it's not very helpful for my inner fat girl. eh. oh well. and thanks for the message. my family says their love.